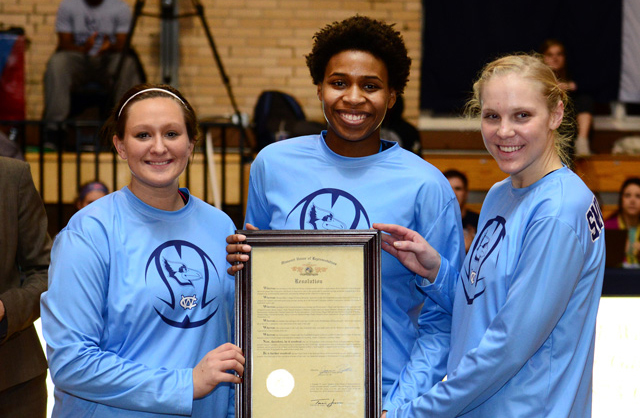 Above photo, from left to right, Tylere Goans ’16 (California, MO), Danielle Williams ’15 (Waynesville, MO), and Danielle Smulczenski ’15 (Springfield, MO) hold a resolution from the Missouri House of Representatives, recognizing the 2013-14 Lady Blue Jays basketball team’s status as number one in the nation for academics (NCAA Division III women’s basketball). 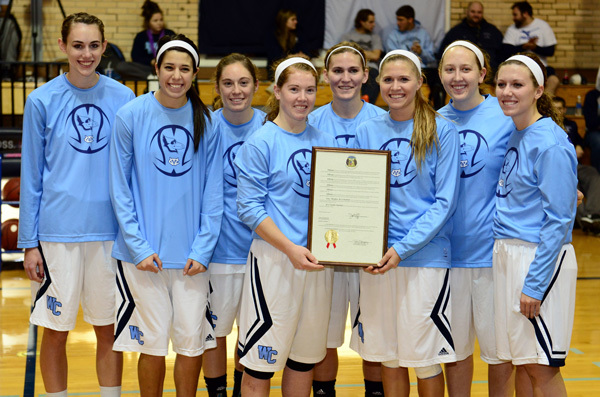 Recognizing the Westminster College Lady Blue Jays basketball team’s recent prestigious national academic achievement, Missouri State Representative Jeanie Riddle presented a Missouri House of Representatives Resolution to the team on Wednesday evening, December 3. The ceremony took place center court in the Historic Gym on campus. A Senate Resolution sponsored by Missouri Senator Jolie Justus was also presented to the team by Dr. Carolyn Perry, Vice President and Dean of Faculty. Senator Justus was unable to attend the ceremony. 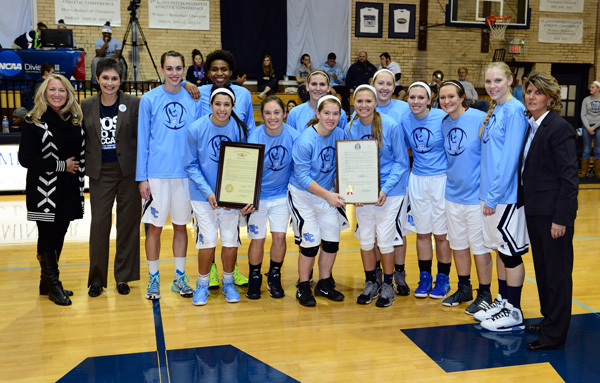 The Lady Blue Jays accept a resolution from the Missouri Senate, in honor of their top national achievement. The Lady Blue Jays achieved a 3.642 combined grade point average – the highest GPA for any NCAA Division III women’s basketball team in the country – for the 2013-14 school year. This combined GPA is calculated inclusive of all student-athletes on a team’s roster. 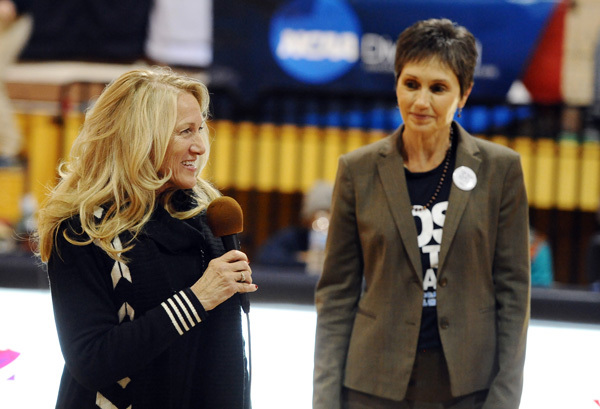 The Lady Jay’s number one ranking is a first in the Westminster College program’s history. This marks the Lady Jays’ fourth appearance on the WBCA Academic Top 25 Team Honor Roll, gradually climbing to this first place honor. The Lady Jays earned the twenty-fourth place honor for the 2009-2010 academic year, thirteenth place for the 2011-12 school year and fourth place for the 2012-2013 academic year. Westminster College was the only team from the St. Louis Intercollegiate Athletic Conference to be ranked in the WBCA Academic Top 25 Poll. A game between the Lady Blue Jays and Webster University followed the presentation, with the Westminster women defeating Webster. State Representative Jeannie Riddle, Dr. Carolyn Perry, the 2014-15 Lady Blue Jays basketball team, and Coach Tracey Braden.